What a night it was at UFC 229 and I’m still kind of trying to recover from it :). 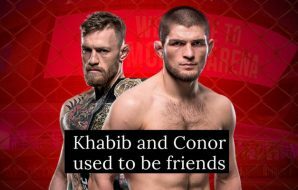 What great fights we saw with the last one being Khabib Nurmagomedov vs Conor McGregor bout which we are all have been waiting for a very long time. It was a good fight – maybe disappointing for Conor McGregor’s fans but his loss didn’t come as a surprise. Khabib Nurmagomedov is currently the best Lightweight in the UFC and might be the best Lightweight of all time. Conor didn’t have many opportunities and Khabib dominated the whole fight until it ended in the 4th round. 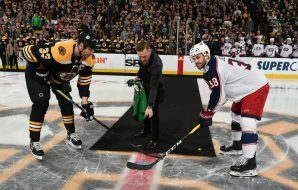 To sum it up, McGregor looked sloppy and unprepared after 2 years of being out of the game. Khabib choked out McGregor but it wasn’t the most memorable moment of the night. A few seconds after, Nurmagomedov pointed at McGregor’s corner behind the Octagon, threw his mouthpiece towards them and jumped over the cage. 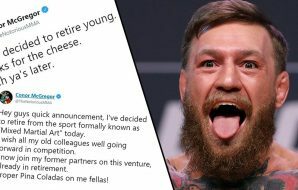 He went after Irishman’s friend and sparring partner Dillon Danis who is also a Bellator welterweight fighter. Here is a good video of madness that happened seconds after the fight was over. It’s unknown exactly why Khabib went specifically after Dillon Danis. 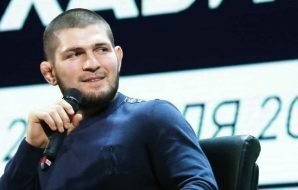 According to the radio host Joe Rogan (he was by the cage side at the moment), Dillon was “absolutely provoking and insulting Khabib throughout the fight”. Rogan said that he thought Nurmagomedov would just jump to the top of the cage to say something back not attack that person in the crowd and cause a chaos. Anyway, Khabib and Dillon Danis had a beef back in the day when they both trained at the same gym AMA Fight Club in New Jersey. Danis is a black belt BJJ world champion and we all know Nurmagomedov’s opinion on jiu-jitsu. 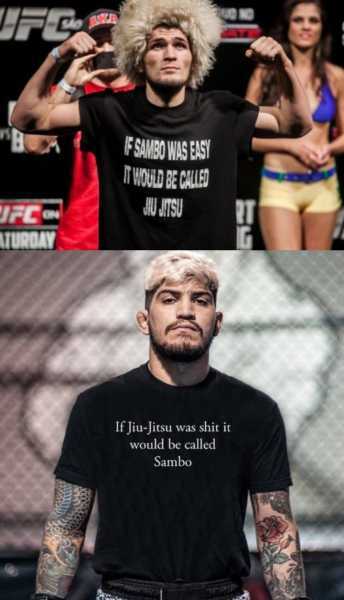 Khabib Nurmagomedov and Dillon Danis for a while had a conflict about sambo vs jiu-jitsu rivalry. Dillon Davis, on his side, said many unpleasant things about Khabib, his abilities and chances against Conor McGregor. It’s interesting – everyone expected Conor McGregor to get under Khabib’s skin but in reality, Dillon Danis was the one who made it happen during the fight. 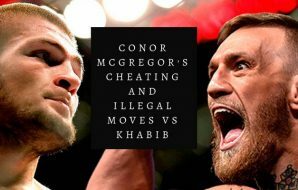 A little bit too late but still it might play it’s part if there will be a re-match between Nurmagomedov and McGregor. Nurmagomedov did an amazing job at staying away from McGregor’s provocations with the bus attack, trash talk about his family and religion during press-conference. He did not react to stuff like that besides saying “we will see on October 6”. Well, Khabib delivered what he promised. I also think what happened after the fight is that he just emotionally exploded because of the adrenaline and pressure. He kept everything inside for the longest time and after it was over, all this anger went out. We are all humans and we all make mistakes. After all, it was an incredibly stupid action from Nurmagomedov and his teammates and right now I’m sure they realize it. Khabib’s actions were not as bad as his teammates. 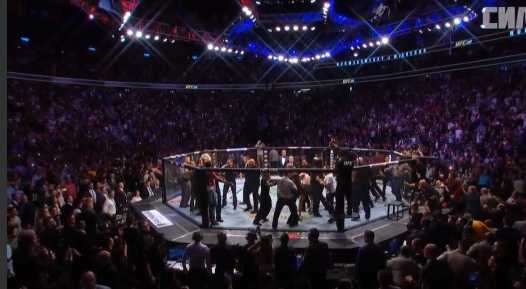 People from Nurmagomedov’s corner jumped inside the Octagon and started attacking Conor McGregor who already recovered after being choked – he was trading blows on top of the cage. Khabib’s cousin Abubakar Nurmagomedov who had papakha hat in his left hand. 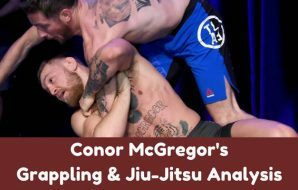 Conor defended well and even smashed him in the face. “A guy in the red shirt” – Esedulla Emiragaev. He is Khabib’s wrestling coach at home in Dagestan. 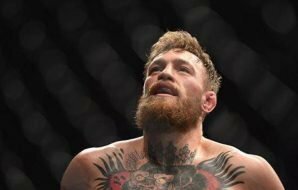 Emiragaev attacked and punched McGregor’s head from behind. It was a disgusting move. Zubaira Tukhugov – Khabib’s close friend and his training partner who fights in the UFC Featherweight division. He is the one wearing a black t-shirt and black pants if you are watching the video. 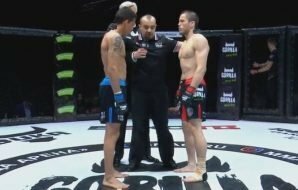 Tukhugov and McGregor traded a few punches after which the Russian stepped back. Tukhugov had a scheduled fight vs Conor McGregor’s friend Artem Lobov which will most likely be canceled. 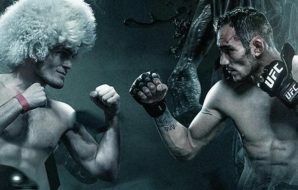 According to Dana White, Tukhugov won’t fight in the UFC ever again. What a stupid way to ruin your career. Gladly, this chaos after Khabib vs McGregor bout didn’t lead to any serious injuries. 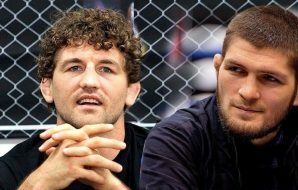 3 people from Nurmagomedov’s camp Esedulla Emiragaev, Rizvan Magomedov (manager) and Abubakar Nurmagomedov were detained by police but later released because Conor refused to press charges against them. McGregor deserves respect for the way he handled this whole situation. After all, he is the best at playing these games. He lost the fight while being choked again and it’s not the thing that everyone is talking about. 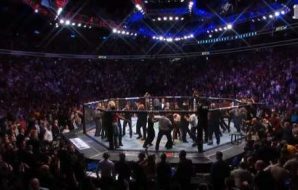 Conor should be pretty happy with the way things ended because this brawl after the fight leaving him a chance for a re-match. What will happen next? 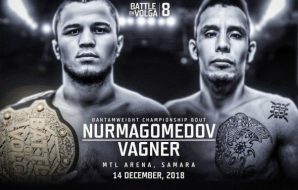 Will they strip a title from Nurmagomedov? I highly doubt it. There are no charges against him. 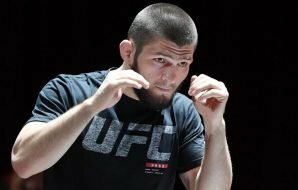 The money Khabib was supposed to get for the fight were withheld by the Nevada State Athletic Commission until the end of the investigation. Soon after the incident, “The Eagle” publicly apologized for his actions. In the end, he will most likely avoid any suspension and will probably just have to pay a bunch of fines. Khabib’s teammates involved in the brawl, on the other hand, are in more trouble. 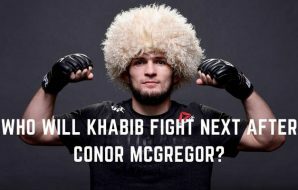 Looks like it’s heading towards Khabib vs McGregor 2. 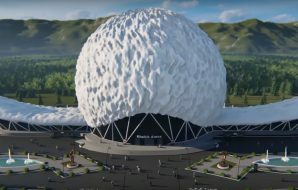 What do you guys think? Finally someone actually took the time to correctly identify the guy in the red shirt, I’m sick of the ‘tabloid journalists’ that do no investigating of their own and innocent people are unfairly targeted. As for Khabib/McGregor 2, I think Tony Ferguson is next in line for the belt, which he should’ve never been stripped of in the first place. Khabib vs Ferguson or Ferguson vs McGregor then the winner of that fight vs Khabib.